Posted: April 22, 2017 9:00 a.m.
As an archivist with the University of Regina, Crista Bradley has a unique perspective. She’s responsible for preserving and protecting original materials that trace the university’s roots back to the founding of Regina College in 1911. She also helps faculty and students conducting historical research to access relevant documents in the Archives & Special Collections. Bradley, who recently returned from a two-day workshop on the rapidly-advancing field of electronic records preservation, looks to the future as well. She assists everyone from administrative staff to department heads in managing their records, primarily digital documents, for posterity or safe disposal. For the sixth year in a row, the University has been recognized as a top employer in Saskatchewan. From its modest beginnings, the school grew and evolved and in 1974 became a degree granting university. Today, it has 10 faculties with programs leading to bachelor’s, master’s and doctoral degrees. With more than 14,500 full- and part-time students, it is also home to seven Canada Research Chairs and approximately 2,000 full, part-time and student staff. Situated in Wascana Park, the University of Regina and its three federated colleges are housed in one of the largest urban parks in North America. Wide-ranging amenities include the medical services, theatres, restaurants and fitness facilities, all open to university employees as well as students. 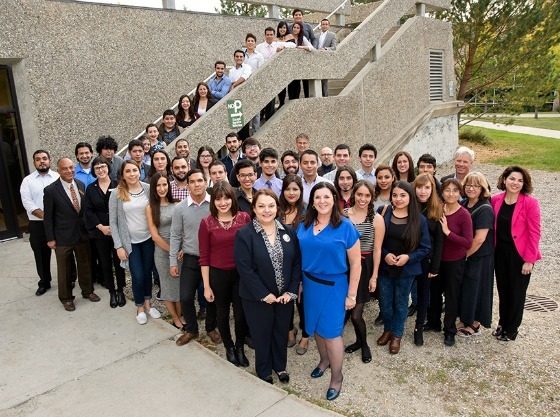 “We’re big enough to be comprehensive and small enough to wrap your arms around,” says Dr. Vianne Timmons, President and Vice-Chancellor, who also notes the diversity on campus where employees and students come from 102 countries. Another source of pride for Timmons is the university’s growing reputation for teaching excellence, groundbreaking research and community service. One way the university is working toward that bright future is the career development of staff and faculty. Bradley participated in one such initiative – URLeading – which is aimed at developing the next generation of leaders. URLeading brings together staff and faculty members to further develop their leadership skills as well as better understand the important interdependence of all functions of the University. Even after the program ended, Bradley says she has made long-lasting connections where the staff and faculty who participated with her continue to meet monthly.